Kompetenzinitiative zum Schutz von Mensch, Umwelt und Demokratie e.V. in cooperation with diagnose:funk – Umwelt- und Verbraucherorganisation zum Schutz vor elektromagnetischer Strahlung, Europäische Akademie für Umweltmedizin (EUROPAEM), Pandora – Stiftung für unabhängige Forschung, Verband Baubiologie and other partners, and sponsored by Stiftung für Kinder, Freiburg and Auerbach Stiftung, Tettnang, organize an International Public Symposium on “Technical progress or progressive irresponsibility? Biological Effects of Wireless Technology” that will take place on October 4. – 6., 2019 at the Kurfürstliches Schloss Mainz. Cell phones, Smartphones, Tablets … Smart Home … Smart City … Internet of Things … The digital transformation of our society is expected to continue with the new 5G standard, largely through mobile and wireless communication. As a result, radiation exposure due to mobile and wireless communication technologies, their infrastructure and applications will increase enormously. What health risks are involved? What are the possible consequences for particular groups at risk, especially children and adolescents? 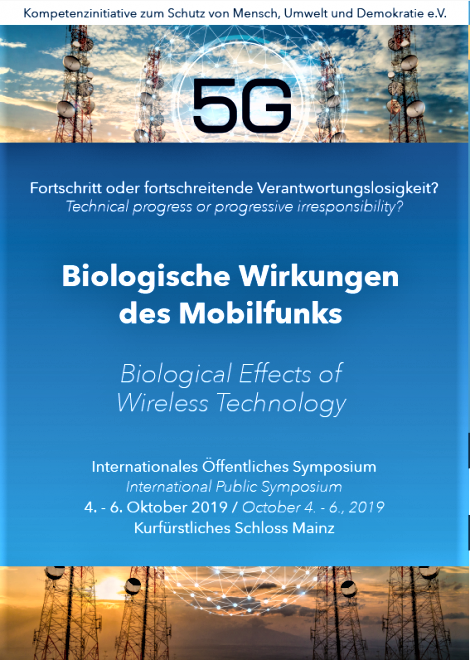 The conference will provide easy-to-understand overviews of the “biological effects” of mobile and wireless communication technologies as well as in-depth discussions that will be as accessible to non-experts as possible. Internationally renowned speakers will share firsthand information and recommendations in lectures, workshops, documentary films and panel discussions, inviting everybody to join the discussion. presented by Klaus Scheidsteger & Dipl. Ing. Lothar Moll. All presentations and discussions will be simultaneously translated into English or German, respectively.The Electoral Palace of Mainz, the conference venue, will be kept free of Wi-Fi.